GRIM REALITY: Private Levi Sutton, from Darlington. The Durham Pal was killed exactly 100 years ago – does he have any family still in the area? EASTER Week of 1916 saw the Durham Pals waist-deep in water and thoroughly miserable. Exactly 100 years ago Easter was three weeks later than this year, and so it was on April 20 – Maundy Thursday – that the volunteers of 18th Battalion of the Durham Light Infantry were ordered into the trenches near Auchonvillers, in the Somme region of northern France. There they remained until Easter Monday. It had rained or snowed almost continuously for weeks, ever since the Pals returned from the sunshine of Egypt in early March, and the frontline firing trenches were flooded. Although the water was waist high in some trenches and knee-high in others, trench life continued with relentless rounds of sniper and mortar fire and night patrols into no-man’s land. On that first night back in the trenches, Private Levi Sutton from Darlington was wounded by German trench mortars and subsequently died of his injuries. 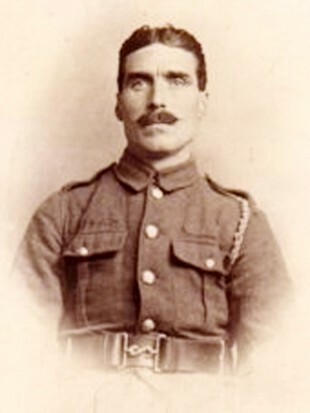 The 36-year-old, from A Company, was born in Cockerton and had spent time working as an insurance agent and, despite being less than 5ft 8in tall, he had served with the 1st Battalion of the Durham Light Infantry. In 1904, Levi married Mary Hannah Crosby and the couple had two children, Violet, who was ten when her father was killed, and Eland, who was four. At the outbreak of war, the young family were living at 86 Westmoreland Street, off North Road, in Darlington. As a 34-year-old veteran with previous military experience, Pte Sutton re-enlisted in his home town in September 1914 and joined the Durham Pals. On his death, his widow received a pension of 21 shillings a week to keep her and her two young children. It was a terrible return to the trenches for the Durham Pals. However, the morning of Easter Sunday dawned bright and brought a change in the weather which reportedly lifted the Pals’ spirits. At about 9pm on April 24, they were withdrawn from the trenches, having seemingly suffered no casualties over the four days despite the ever-present danger. Under cover of night, the entire battalion was brought back down Railway Avenue, a trench which followed a two-mile course from the front to the reserve and the tiny village of Colincamps. For four days, the Pals rested up at Colincamps to recover from the trenches and lick their wounds, but even here there were ever-present reminders of how precarious their life was. Outside the village stood Sucrerie Military Cemetery, then a small and peaceful graveyard opened by the French in the summer of 1915 to bury their war dead. Unbeknown to the Pals, within months the cemetery would be enlarged as it became the final resting place of hundreds of their comrades at the Battle of the Somme, including Pte Sutton. The battalion remained at Colincamps until the evening of April 28, when they were moved further back into the reserve and the village of Bertrancourt where, according to the battalion’s war diary, “there was a very fair hutment camp” and they could recuperate in relative comfort. It provided an opportunity for the battalion to pay their respects to one of their fallen comrades. On the morning of March 29, Pte Arthur Armstrong, a 26-year-old from Crook, had become the first of the Pals to be killed in France when he was hit by shrapnel from a bomb dropped by a German aeroplane as the battalion made its way towards the front. When his funeral was held and he was laid to rest in Betrancourt, his friends were in the trenches and were unable to be at the service. Now stationed in the village, several of them were finally able to visit his grave in the village cemetery to pay their respects to their first fallen comrade.